Caption slip reads: "Photographer: Mack. Date: 1960-05-11. Reporter: Hertel. Assignment: Missing girl. Brendyth Jane Ramage, 16 months, shown at 77th St. Police Station. 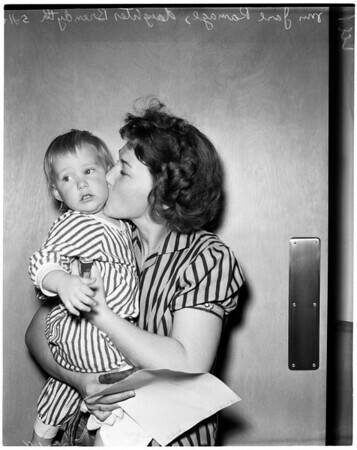 Mrs. Jane Ramage holding her missing daughter, Brendyth Jane Ramage, 16 months. Police officer Sam A. Johnson walking with Brendyth Jane Ramage, 16 months, at 77th St. Police Station".